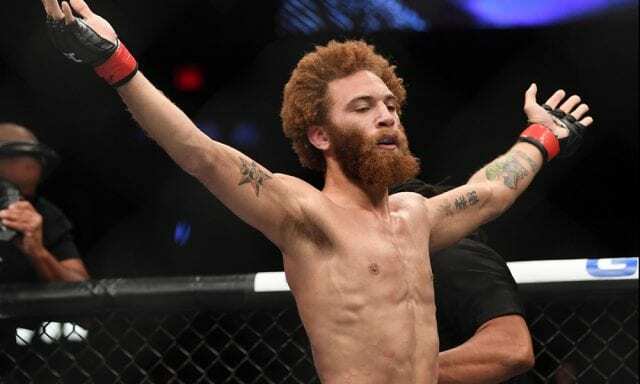 Luis Pena and Steven Peterson threw down in a featured featherweight bout on the UFC Nashville main card. As always, LowkickMMA will have you covered with all the results from UFC on ESPN+ 6 as they happen. Pena (5-1) is looking to rebound from his first loss as a professional fighter. He will do so in a new weight class as Pena has opted to drop down to 145 pounds. (but missed weight at 148.5 pounds). 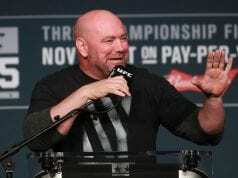 As for Peterson (17-7), The Contender Series alum has gone 1-1 in the UFC. “Ocho” will look to put his first winning streak together since July of 2016. Peterson launches to the center with a Superman punch. It misses the mark but he presses forward to clinch Pena against the cage for a takedown. Pena defends with a kimura and sweeps. Peterson transitions to an armbar and Pena slams him on the canvas. Pena ends up in Peterson’s guard and moves to half guard. Both men scramble for position and Peterson eats a right hand as he gets to his feet. He presses Peterson to the cage and lands a hard elbow. Pena lands a knee and another hard elbow. Peterson lands a right hand. Pena throws a flying knee that just misses Peterson’s dome. 30 seconds left in the round. Peterson forces the issue and gets Pena to the cage. The round ends with Pena cracking a hard right. Both men meet in the center and fire. Pena moves forward and lands a combo. Peterson closes the distance with three straight jabs and lands a takedown. He jumps on Pena’s back and gains a standing body triangle momentarily. Pena shakes him off and lands a hard right hook. They clinch and both men scramble for position as Peterson lands a quick takedown. Pena gets back to his feet. He trips Pena again and jumps on his back. Peterson is wearing on Pena here in round two. Pena breaks free with a flurry of punches. He lands a hard elbow followed by another flying knee attempt. Peterson throws a spinning back elbow. Both men throw kicks at the same time but Peterson moves in to clinch Pena against the cage. Pena reverses, both men unload as the round ends. Pterson moves forward with a purpose and meets Pena. Pena lands a right hand and backs off. he lands a lead uppercut and a head kick. Pena lands a forearm shiver. Peterson moves in for a takedown but Pena hits a switch. He works his way to the back of Peterson and lands a knee as he breaks. Peterson lands a heavy right hand followed by an inside kick. He presses Pena against the cage as Pena attacks a kimura. He settles in and looses the submission. Peterson ends up on top but Pena reveres like it was no big deal. Peterson looks for an armbar and transitions to a leg lock. Pena defends with punches to Peterson’s head. Both men get to their feet and Pena lands a head kick. Peterson is hurt as he looks for a takedown. 30 seconds left and Peterson is trying to hold on. Pena lands a flurry as the round ends.